Getting the right look for the right occasion is a hinderance that we all know to some degree. Even though we make our way by two-wheels, that is not to say that we forgo the same thought process when planning our commute. We want to look cool. At the same time, we want to be sure we are doing our part to protect ourselves from the rigors of the road. With that being the case, something such as the Scorpion Covert Flannel Shirt can come in super handy for a casual ride around town. As an armored motorcycle shirt, the Scorpion Covert Flannel shirt is both an easy-going fashion piece, and a dedicated article of protective motorcycle gear. While it won’t be something that is built for track-day speeds and defenses, it does have an augmented level of protection when compared to just a regular flannel shirt. Reinforced with 165G DuPont Kevlar lining to guard against a slide across the pavement, it also has pockets that have been incorporated into the elbows and shoulders for the inclusion of Sas-Tec CE Certified armor that can be purchased separately. Sometimes when you are just cruising down the street, around town, or even out for a joy ride amongst the twisty country roads, you really don’t want to throw on a full-leather jacket and all of the thickness and extra hassle that comes with storing it when you put the kickstand down. 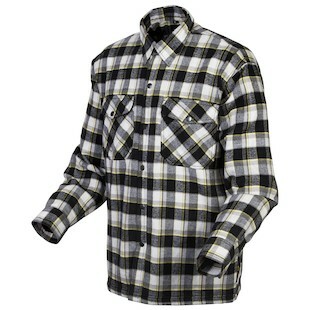 For times like that, just throw on something like the Scorpion Covert Flannel shirt, and get going!